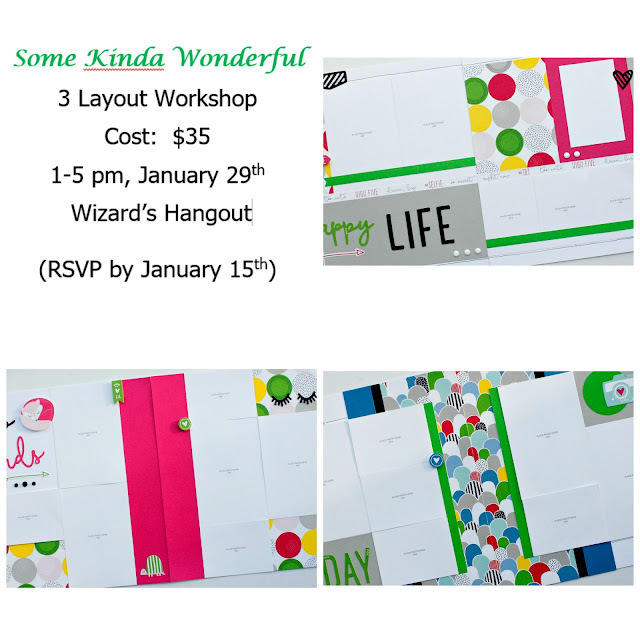 Wizard's Hangout: Some Kinda Wonderful 3 Layout Workshop!!! Some Kinda Wonderful 3 Layout Workshop!!! A new year, new product, and a new Some Kinda Wonderful Workshop! Join me for this workshop where we will be making 3 double page layouts with the new CTMH Some Kinda Wonderful papers, Some Kinda Wonderful Complements, and new Black and White Dots. All of your papers will be pre-cut, so all you have to do is assemble, embellish, and add your photos. Email me at vwizniuk@pris.ca, or call or text me at 250-263-1489 to reserve your spot! If you are local and cannot make it on this date, you can contact me if you would like to purchase a kit. Cute! I started out with Some Kinda Wonderful, too. Believe it or not, I made a baby shower album with this kit. Happy New Year!